Hey Zero Two! This is how you do an ending! This returns to the Adventure school of “time's up, gotta go,” as the Digimon are forced to return to the Digital World. In fact, every season from here on out separates child from partner in some capacity (yes, even Frontier to an extent). This one, however, is a nasty gut punch as there appeared to be no compelling reason (like returning home) to force the parting of the ways. Then just like that- doomsday. First, of course, the tamers had to get to that point. In doing so, one character does a masterful job assuring his right to exist in spite of all the naysayers that say he achieves no purpose. That's right- Ryo! 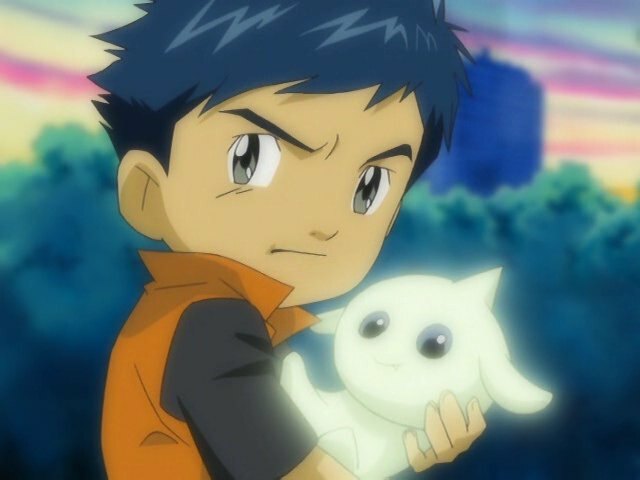 Despite the way he's thrown into the series, the awkward way he's maintained and his limited contributions to the story outside of the plot, he winds up in a unique position where he is the only character who can properly work with Sakuyamon to close the book on Rika and Renamon's story. Takato's finishing move is sheer determination and willpower. Henry's is trusting in others and being willing to jump into danger no matter the risk. Rika and Renamon, who started their partnership as a way to get stronger, willingly put themselves in a state of overt vulnerability to give Rika's biggest rival the strength to make a meaningful attack. And they weren't even concerned about themselves. Their fear was whether or not Justimon could handle the energy they were giving him. For the first time in the whole series, Ryo was the only character for this job. As a bonus, we also got the best of his trademark flirting and the sight of Sakuyamon stripping her armor to make Justimon's weapon bigger is dodgy as all hell. That attack... doesn't actually work. The Sovereign come up out of nowhere to finish off Cable Reaper. That's okay though: even though it manages to run afoul of two pet peeves (the awesome moment of awesome not actually working and some external force bailing the heroes out), letting the external force get another chance to jump in and make a meaningful contribution is an appreciated sendoff of important characters that we had all forgotten about. While all that's going on, Gallantmon's making a beeline for Jeri, only to be intercepted by Jeri-Type. After an existence-affirming final speech destroys the first agent, Shibumi's red card miscalculation is the only thing keeping Takato from Jeri. It's a convenient wrench as it seems like such a big deal, yet the forced separation means Guilmon gets to fling Takato towards his girl, allowing him and him alone to be the big damn hero. Man, that rescue shot... if they weren't twelve, he'd so be getting laid. Of course, even as D-Reaper is eradicated and the day is saved, the kids later realize the terrible cost: in order for the worlds to be properly stabilized and healed, the Digimon must return to the Digital World. There's no two hour window to say goodbye privately this time, nor is there any sign that a reunion is possible. 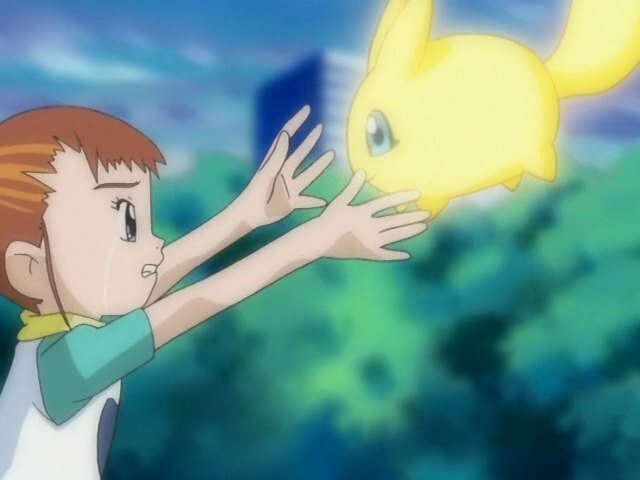 It's cruel, devastating and a sure tear-jerker, a final sign that as fun as it sounds to have a Digimon partner, ultimately the sacrifices required are terrible burdens for these children. Janyuu had realized this inevitability long ago, and realized that between encoding the Juggernaut program in Terriermon and forcing their separation, his relationship with his son would be forever affected. As this season reminded us, the sacrifices required are terrible burdens for these adults as well. And yet... they always want more. And the Digital World always provides. The editing makes it look like the Kernal Sphere is flooding as a direct result from Sakuyamon's attack on Cable Reaper. Either way, that look on Jeri 's face as she and Calumon are about to drown in chaos is awful. For an agent based around mind games, Jeri-Type suddenly has impressive strength. It's sorta like how Bond supervillians who make their money with their minds suddenly become really hard to kill in the final confrontation. How exactly did Jeri start floating above the Kernal Sphere? It didn't look like MarineAngemon had charged in to save the day yet. It's hard to understate how important it was to both introduce Ai and Mako formally as Impmon's tamers and have Impmon receive Jeri's forgiveness. One thing that bothers me is that Janyuu seemed to know that the Digimon would have to go back to the real world, but didn't tell the kids until the very last moment (and there must have been an opportunity if Ai and Mako had time to return home). Why not give them the same deal Gennai gave the digidestined in Adventure? Then again, that might be easier said than done: Janyuu may not have been able to bring himself to bear the news at that point. In the bakery during the epilogue, Yamaki has a bitching jacket with that Hypnos insignia (the one featuring Yamaki's trademark sunglasses) emblazoned on the back. It's gotta mean something that he's wearing that around weeks after this all went down. Pretty sure Calumon was the one protecting Jeri at that moment. No comment on them using the worst animation team ? By the way, you do know the dub made a drastic change in henry's reaction to janyu? In the Japanese Jenrya accepted what his father had done and why and forgave him, meaning he now has the wisdom of an adult, while the dub made it look like he simply hated Janyu for what he did, reasons be damned. I'd really like to know Pulver's thoughts on this. It's all in that sad smile. I don't take it as Henry hating his dad so much as "I get why you had to do it and I understand. But it just really stings right now and it'll take time." The second sentence is the only context that the dub adds. It's different, but it isn't drastic, nor does it ruin the family. I actually like it; the parting was so (unnecessarily) sudden that the kids shouldn't be completely cool with it in the immediate aftermath. On Janyuu and the timing issue; in the Message in a Packet CD drama, Juri says that the Tamers and Digimon were separated "barely seconds" after the disappearance of the D-Reaper. She may be exaggerating (it's a pretty emotional CD) and I'm not sure who worked on the CD so the canon may conflict but who knows, I for one certainly prefer Janyuu not being given an opportunity to tell the Tamers. I think that an ending without goodbye like 02 is actually better than an ending with goodbye. I like that the final comment on this series is about Yamaki's bitchin jacket.